THE GOLDEN GREATS are a dance-funk-punk-junk ensemble who play parties in the greater Portland area. Listen to them on Myspace! 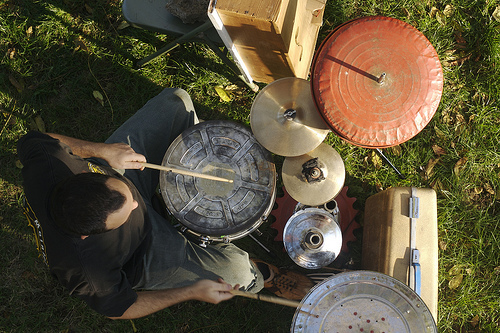 In this band, Mykle plays drums made of garbage. THE HEMISPHERIC CHAMBER ORCHESTRA is a term for whatever group of musicians gathers to perform avant-garde classical music in public. Mykle has played guitar and death star with this bunch. BOHEMIAN ONSLAUGHT was once a mighty, terrible thing to behold! Alas, they drank themselves into legend. Mykle sang, played rhythm guitar and wrote press releases.